Christie’s London invite you to step back in time when 1,000 years of Islamic splendours are unveiled. These works of extraordinary quality, rarity and beauty, from the sales of Art of the Islamic & Indian Worlds (25 April), Oriental Rugs & Carpets (23 April), and A Private Collection Donated to Benefit the University of Oxford (25 April) are expected to realise a combined total in the region of £7 million. A rare gilt-copper (tombak) helmet (çiçak) (estimate: £300,000 – 500,000) from 16th century Ottoman Turkey. 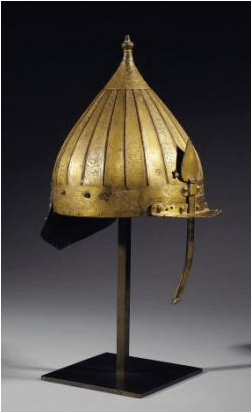 This magnificent helmet is unlikely to have been used in battle, because of the softness of the metal, but rather for parades and other ceremonial use, enhancing the pomp and splendour of the Ottoman army. 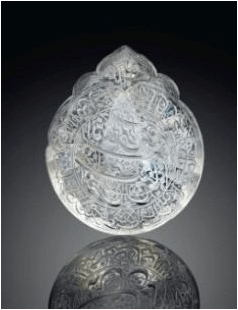 An Imperial carved rock crystal seal of Shah Sulayman Safavi, ruler of 17th century Iran (estimate: £200,000 – 300,000). This intricately carved seal is a remarkable survival; while the rock crystal was infamously difficult to carve upon, the seals were also extremely fragile and whilst they were important tools of administration, seals were often destroyed to ensure that they didn’t fall into the wrong hands. A rare Fatimid lustre jar, from 10th/11th-century Egypt, (estimate: £200,000 – 300,000). This exceptional jar is an extremely rare intact surviving example of the decorative heights achieved by Fatimid potters. A beautiful silk and metal-thread Koum Kapi carpet which is undoubtedly one of the masterpieces of Koum Kapi weaving (estimate: £120,000 – 180,000). An impressive pair of gold damascened forged iron ‘Alhambra’ vases (estimate: £100,000 – 150,000). These elegant vases, from the early 20th century were exhibited in the Spanish Pavilion of the 1910 World Expositition in Buenos Aires in 1910. 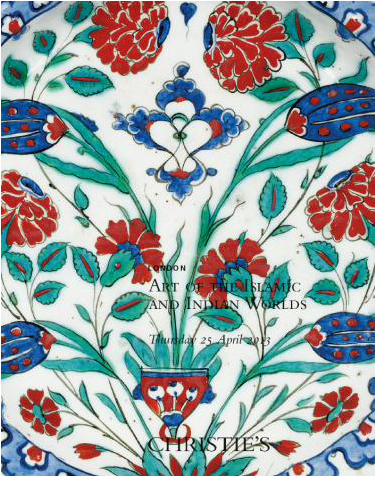 56 lots of works of art on paper from the Islamic and Indian worlds will be sold to benefit the University of Oxford; highlights include a 15th century miniature of The Court of Pir Budaq, (estimate: £70,000 – 100,000).